Junk Chic Cottage: Fireman "Man Cave"
Hello everyone. Hope your week end is going great. Terry and I are heading through all the change ups to the new nest in record time. We have accomplished a lot together in just the short 3 weeks we have been in this home. Terry has lived in my white cottage world with no complaints. So not only does he have a awesome set of tools and knows how to use them he also is so great at letting my decor shine through where ever we have lived. This home being no exception. So when we bought this place and it had the finished basement we both knew this would make for a perfect Fireman Cave for Terry. So while the first level of this town home is white the lower level is fire department collections and all Terry. So excited that he has his own space that reflects his years of being in the fire service along with his fire antiques. Mind you this space only has a third of his stuff!!! All the stuff from his office when he was fire chief is still all packed in many boxes hoping to find a new home soon. The only before pics I have are the real estate pictures from when we bought this place. I had before pictures taken when we moved in but the disk I saved the pics too got cracked and the pictures were gone. WARNING SINCE THIS IS A BASEMENT IT DOES GET A LOT OF NATURAL LIGHT BUT IT IS STILL A BASEMENT SO THE PICTURES MAY SEEM A LITTLE GRAINY. SORRY ABOUT THAT. THIS IS ONE TIME WHEN THE PICTURES DO NOT DO JUSTICE TO HOW NICE THIS SPACE REALLY IS. Before Picture from realtor's pics. Before picture of previous owners man cave. Going down the steps to the Fireman Cave. 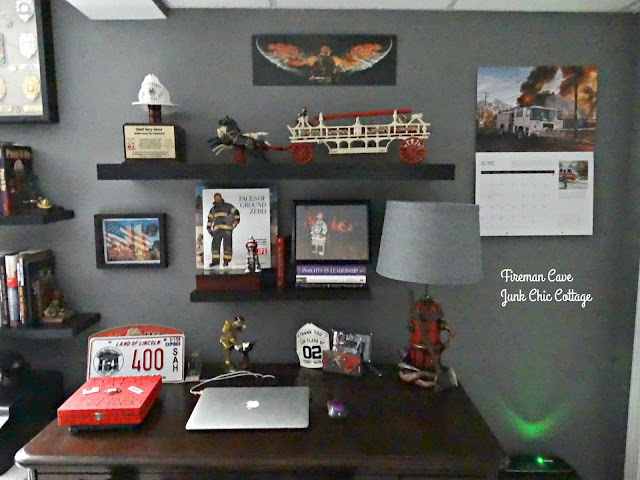 Terry put all his antique little collection of fire trucks on the shelf leading to the basement. Terry has comfy reclining sofa's in his man cave to watch TV. He was able to create his hero, honor and courage wall again with his favorite poem called "who am I" and all his helmet shields the has worn throughout his career. Terry has a full refrigerator, sink and ice tea maker along with a micro wave. So it is all good. Just need to get him a bed down here and he will never have to come up stairs lol! 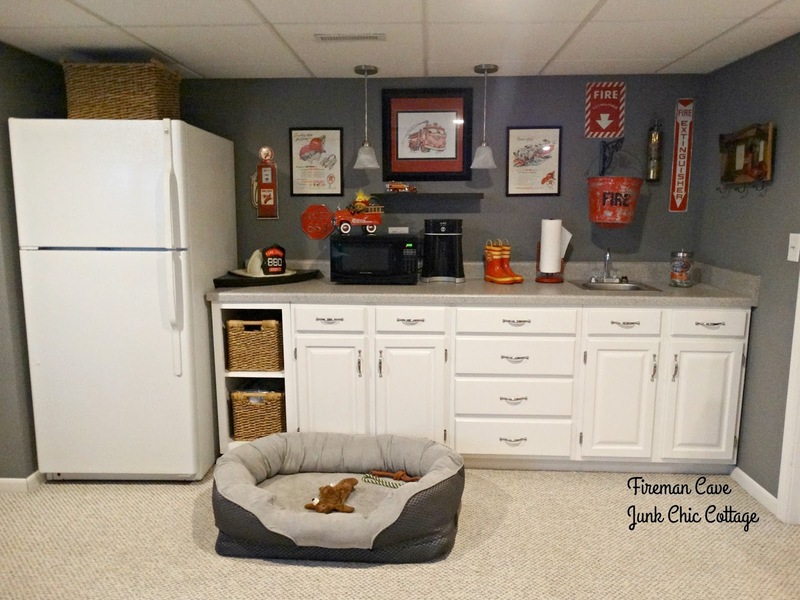 Even little Cooper likes the man cave and has his doggie bed down here. Nice and cool down in this space during the hot summer months. That antique fire door came off an old vintage fire truck. It is one of Terry's prize possessions. The history from that fire truck and door is amazing! Tucked back in the corner is Terry's office space. Up in the left corner is all of Terry's badges he earned through the years of his fire service career. Terry started out as a young fire fighter back when he was in college getting his degree in Architecture. He needed a job to help pay for college expenses and they were hiring young guys to be firefighters. He fell in love with firefighting and finished college but then decided being a fire fighter was his calling. So he got his paramedics and then rose up through the ranks over his 35 year career. 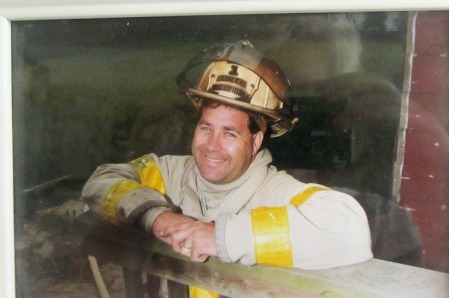 He was in the final stages of his career as Fire Chief, the highest rank he could hold when he lost his job. So while he still wants to work at 58 years old and is hoping to find another chief position he is happy he had so many wonderful years in the fire service. 9ll was a very emotional time for all of us but for firefighters it really hit home. Fire fighters run into harms way to help others. So all those men and women that lost their lives that day trying to help others is a hard remembrance for Terry. He lost a special friend in 911. 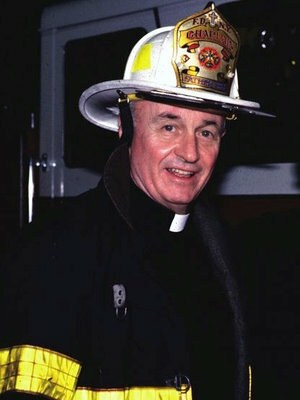 Father Mychal Judge the chaplain for the fire department in New York City. 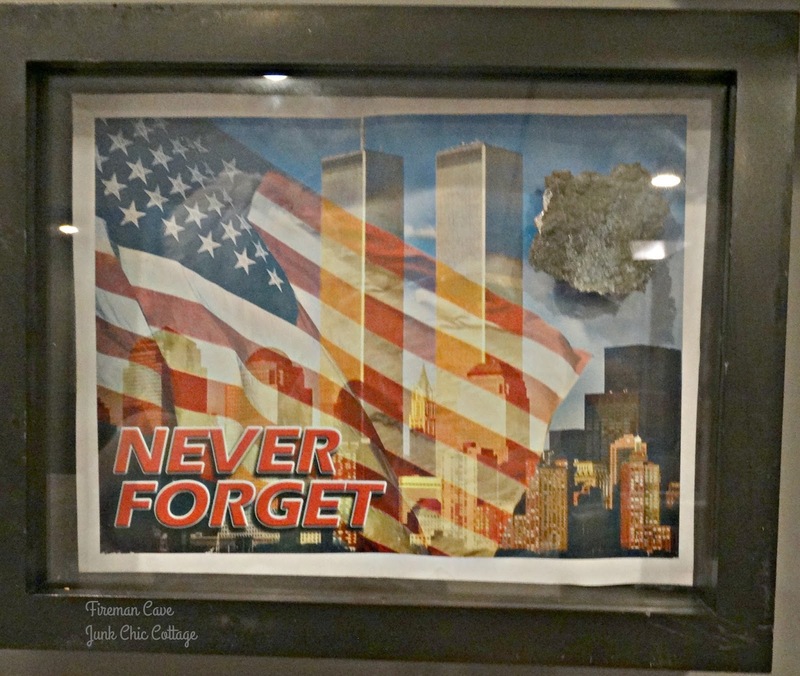 Probably one of the most emotional items in his collection is a piece of the world trade center after 9ll. While this is just a piece of the beautiful towers that were lost that day it is an important reminder of the lives lost. The innocent and the brave just doing their jobs. Every Year we try to make a family trip to Disney and one of the stops is Universal Studio's. 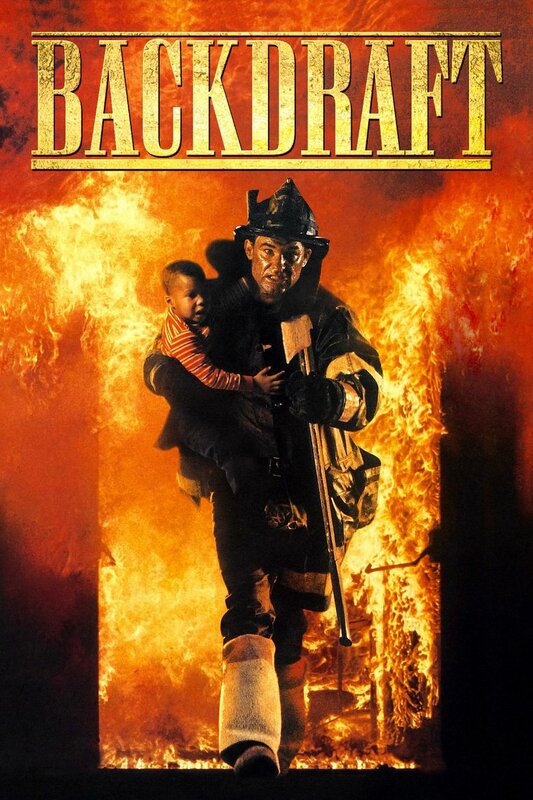 Back years ago on one of our first trips as they were filming the movie Backdraft. Terry was able to get his picture taken in a back drop of one of the posters for the movie premiere. Much more handsome than Kurt Russell RIGHT!!!! There you have it. The Fireman Cave in our new nest. 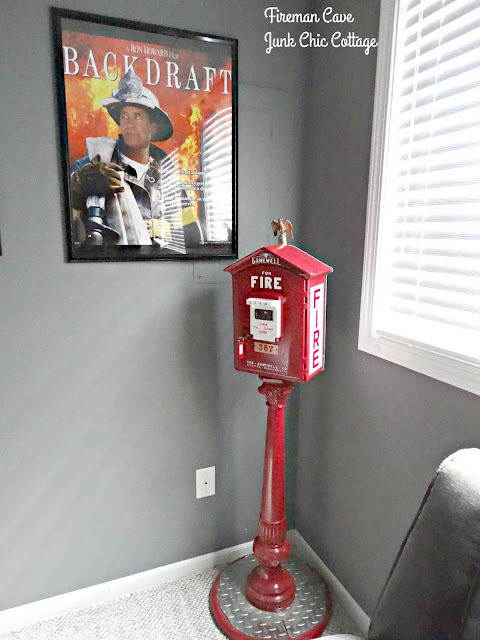 While my white world still exists upstairs Terry has his fire department decor in his man cave. So it is all good in the new place. Thanks for coming by for a visit. Enjoy the rest of your week end. Happy Father's Day to the love of my life. The best dad to our two daughters and the best grandpa to our granddaughter Abby and soon to be granddaughter Charlotte. You are our everyday hero and we love you. His mancave is fabulous. You guys amaze me at what all you can do in such a short time. I love it all. ;-) Can't wait to see more of the upstairs! Happy Saturday! Kris, this is such great space and a wonderful testament to all the years your husband has served others. I am sure that when he sits down there surrounded by his treasures, it is good feeling! :) Plus...you guys do great work!! What a wonderful, wonderful space for Terry! It's so awesome, and you guys are unstoppable! All the special mementos, the history, the pride - you did a really nice job honoring Terry in his space. Did you keep the paint or change it, Kris? 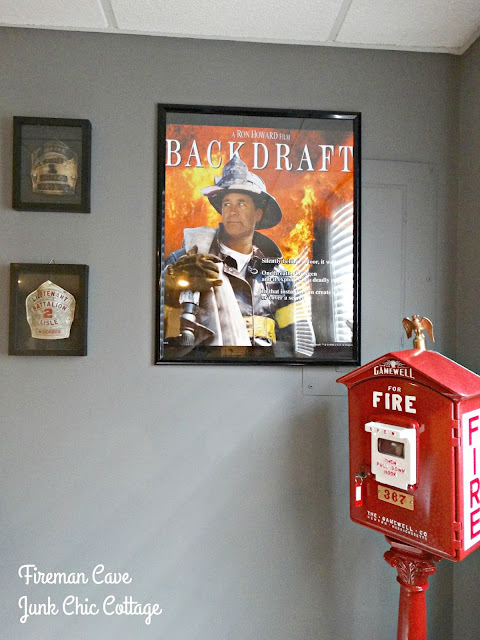 Love that Backdraft poster of Terry! What a wonderful space you husband has! Please thank him for me for the job that he does. That is an awesome space for Terry! The old truck door and all the keepsakes fills the space with character and personality. I know he loves it. Several years ago I saw a house in a home tour with some really cool things like that truck door. I've never forgotten it and obviously you are smart enough to think of things like this without someone showing you. I never would have thought of that and yet it's the kind of thing that just makes the space. I think y'all have found the perfect new home! 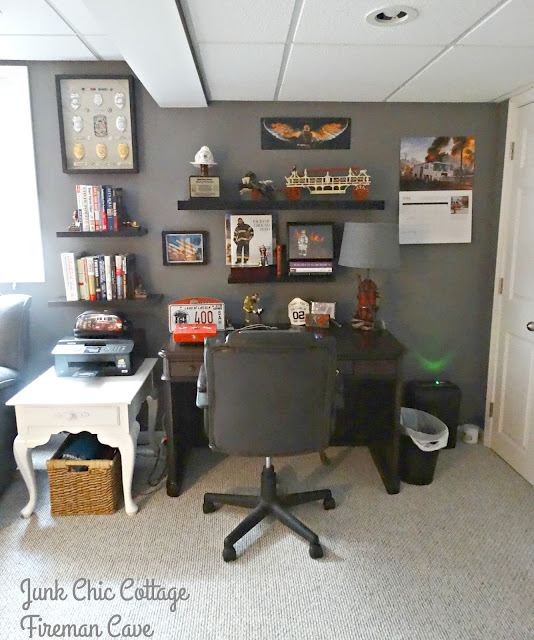 I love everything about this blog post :) Not only have you made his room a place for him to reminisce, but you have also made it a place of honor. My husband is at the end of an almost 30 years for service in the Army and he has his Mancave in a spare room. I love going in there looking at his awards, challenge coins, pictures of special moments with his soldiers and his collection of Army memorabilia. Thank you for sharing! I love seeing all of Terry's collectables. I bet I'm not the only one that wants to hear the story of that door. Terry's man cave is awesome!!! I'm glad he has a space to show all his achievements and hard work....it really is very special. I wish my husband had a cave downstairs because often his mess spills into the other rooms of the house. Not to mention it doesn't exactly math my decor. LOL!!!! Kris - Terry's man cave is so great! What a fantastic place that any man would love. Great job. One of my favorite photographs I've taken was at a 9/11 rally April of '03 at Ground Zero. I was invited to walk with the firefighters because Himself was retired Special Forces and so many of our friends were 'over there'. As I stood not far from Ground Zero facing south, there was a building draped with a huge (stories tall) American flag. In front of me... fire fighters. The shot is awesome. This brought tears to my eyes, with its memories of 9/11. Terry ~ thank you for your service. What great memorabilia you have! That firetruck door on the wall is amazing, and what an awesome piece to have. The two of you have carved out the perfect fireman cave! What an awesome man cave! Love the vintagev fire truck door! 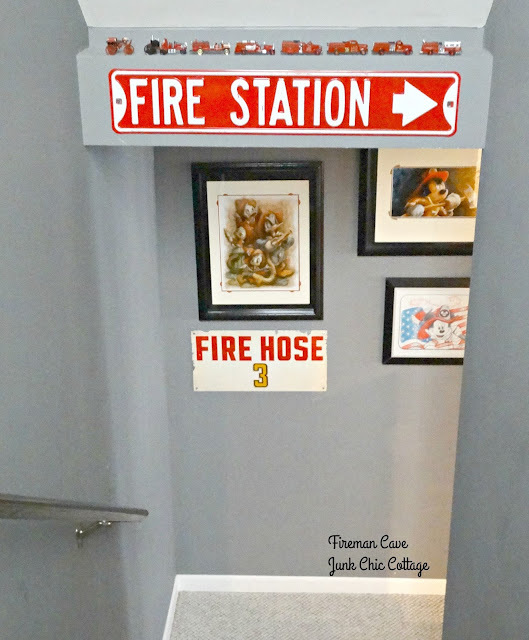 Terry has a really fun and meaningful fire man cave, I love the collections he has gathered through years of being a fire chief. For this vehicle loving girl I love the fire truck door the best... I know you will make Terry's Dad's day very special, enjoy the day mon Amie. 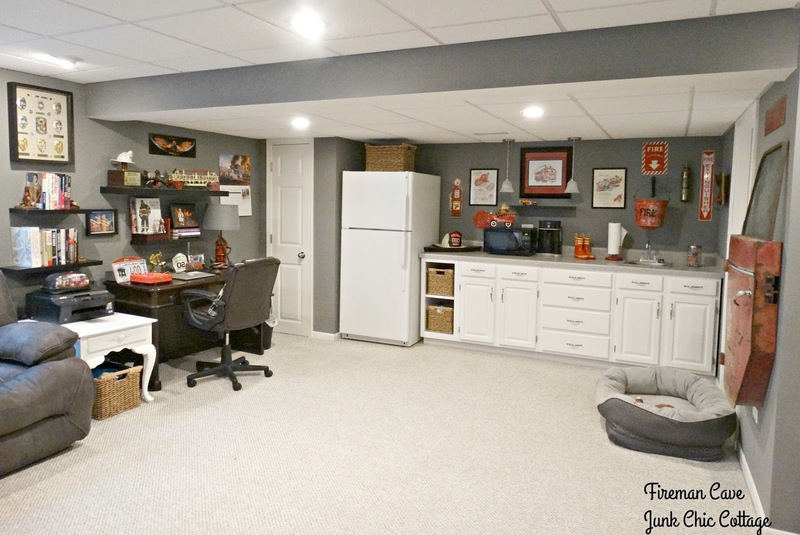 I love this space you and your husband decorated with the firman stuff looks really cool! Yes if there was a bed he'd never have to leave! Lol. I really love his collection of everything. Great job. It Looks like the perfect spot to relax! BEST MAN CAVE, Ever! Now you guys need to enjoy your new home and all your hard work. Thank you for being a fireman. My BIL is a retired Fire Captain & paramedic. Love seeing all your beautiful decorations. Are you finished now? Or, do you have more to do? I've been down with Asthmatic bronchitis for a week now and Shingles, so..... I'm down for the count and so many pills, thank God she didn't send me to the hospital. Think about you often and I am hoping that I will be able to stop off in Chicago for a long lay over on my way back from Virginia. I want to meet you, Jane and Diana, and other blogger from that area Hope that Diana can make it down. Will let you know the date and hopefully we can meet at the O'Hare and have lunch, or something I so want to meet you., Will keep you posted on my plans. Happy Fathers Day to Terry and don't work to hard. Glad Cooper is doing so well. What a great space!! Three weeks???? Your new house is more put together than mine after 14 months!!!! I feel like I am still settling in! Love it, just awesome! 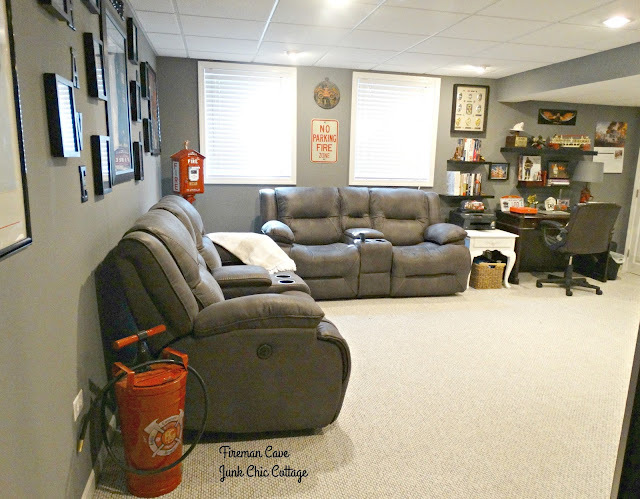 What a great fire man cave! You guys must be taking something special to have SO much energy.. could you send me the secret? What a great collectible collection Terry has.... It might be hard for him to leave such a cool space...maybe you can stay down there with him! It is so true. These men and women risk so much for the sake of helping their fellow citizens and communities....do you know that I could be walking or driving, and when a fire truck comes by and we motorists move over to the curb to let them by, I actually start to cry? I also feel a sense of pride well up in me to my eyes where tears form, thinking of where these firefighters could be potentially facing as they rush past us. God bless them all, God bless you and Terry! I LOVE HIS MAN CAVE! The grays....oh yes he has the touch! And I love his mini fire boots and vintage truck door! You two are much like us; you work TOGETHER, we both don't complain about the other's style but live with it, integrate it....wow. You have done it my friend! I read this, looking at the pictures, with a lump in my throat. My dad was a firefighter also, so on this Fathers' Day, he was already on my mind. Terry's space is amazing; a real tribute to what he is. I love it Kris! What a wonderful space for Terry, full of meaningful mementos. I love the poster and fire truck door. And I got a lump in my throat from the 911 tribute. Thank you for sharing Terry's space with us. A very happy Father's Day to him! Terry's Man Cave is so interesting. 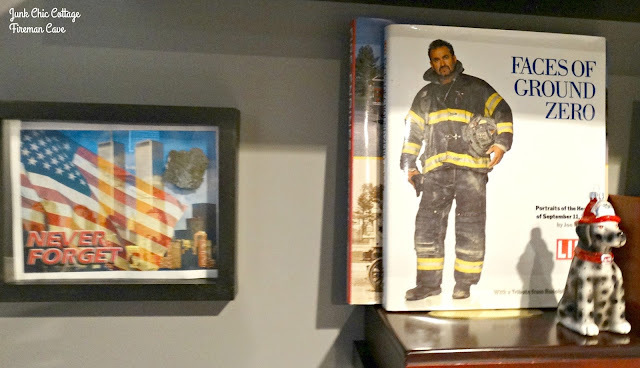 I loved looking at his collections, especially the fire truck door and tribute to 911. Thank him for his service to the community. Good morning Kris, and Happy Fathers Day to Terry! Not only is he super handy, but handsome! You hit the jackpot ;). This post was bittersweet to read. While 911 was a sad day for us all, I can't imagine how Terry must have felt, and still feels. His man cave is wonderful, and he so deserves it! When reading your blog and looking at the beauty in your home, all I can think is: what lucky people both you and Terry are. A strong loving marriage, working together building a cozy nest, enjoying grandchildren and to top it off there is Cooper. I pray Terry finds a rewarding position soon. He simply cannot let this setback diminish him. Thanks for sharing your pictures and your stories. I think after all that searching, y'all really did find the perfect home! I love all the special things he has down there and that fire truck door is my favorite! How perfect! His collections are amazing, especially that fire truck door. Fantastic! I love how it turned out and it looks like a perfect space for him. Would love to hear about that fire truck door. Congrats to both of you for finding this house and making it your home. I love that Terry has a space dedicated just to him, but I see your touch in the styling! Have a lovely Father's Day with your family. This is a very special post. I love the love that you both have for each other and your family. And it is easy to tell that Terry loved his work and did it well. I like the Man Cave, it is great. What an awesome space...I am sure he loves it! And I spotted the tongue depressor jar! This is such a fabulous space for Terry with all of his honors, badges, and memorabilia on display. Lots of great memories that I know bring pride to your whole family. I completely adore Terry's room! Hos cool that? 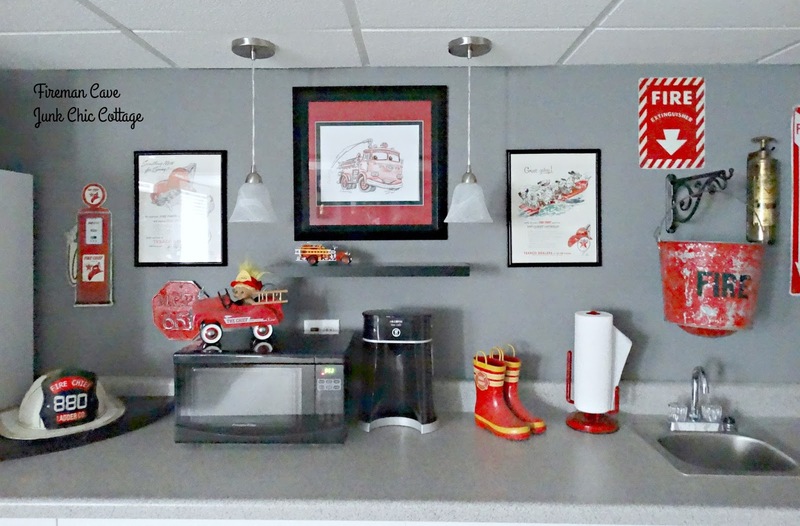 He has some of the neatest mementos and I love how they and the room is all laid out! It's just perfect for honoring his career and for giving him (and Cooper) a cool guy space to hang out in! You are so good! You can even make a man collection look like artful decor! Fantastic! Hugs, Leena Oh! PS Happy Father's Day Terry! That is positively perfect for a fireman! So ahhhhhmazing! That is just a perfect space, and you just got there and started it! I think the firefighters and EMS personnel are just the most wonderful people (and nurses and doctors too). People that dedicate their lives to help others, that is amazing and I am very grateful for all of them. That's an awesome man cave! My husband wants to have one for himself in our next house. We don't have the space here. I love all of the memorabilia in his room. 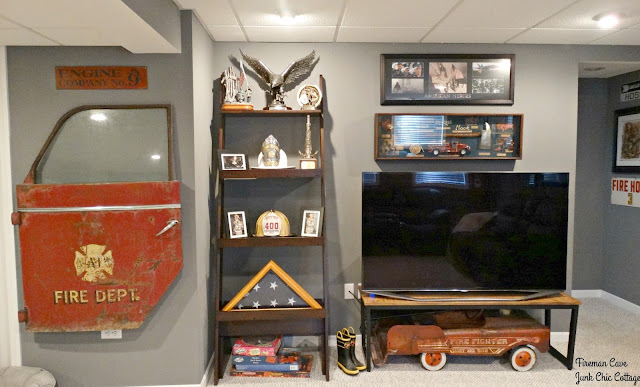 My favorite is the antique fire truck door on the wall. Hi Kris! 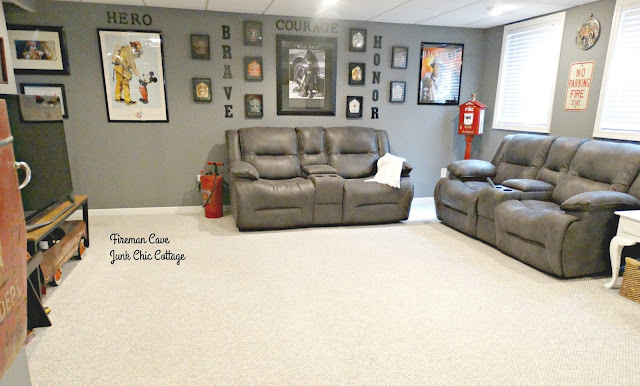 Oh, your hubby's fireman man cave is marvelous! I love all of his memorabilia and how it's displayed! My little grandson absolutely loves fire trucks and he would have a ball down there! Thank you so much for popping in to see me. Terry's man cave is amazing! It's got to be a great feeling to be surrounded by all of his memorabilia. The door is really special. Your post made me want to cry. Your Terry is a hero. Papa is a retired Fire Captain...he has the scars on top of the stories. 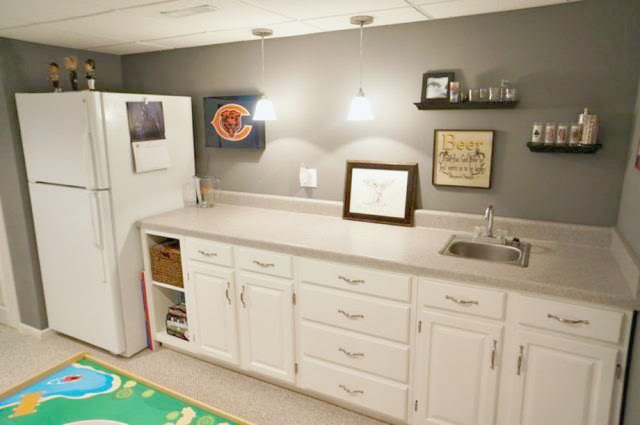 Your man cave--and I know your were the mind behind the masterpiece- is sooooo perfect. Love what you are doing with your new home, Kris! That's a wonderful space to relax and Terry really deserves it, Kris. The colors are great and I love all those firefighter antiques. I hope Terry will be able to find a job in a fire department again. Terry has one awesome man cave...love all the antiques. Hop over today and show it off at our Show and Share Party. 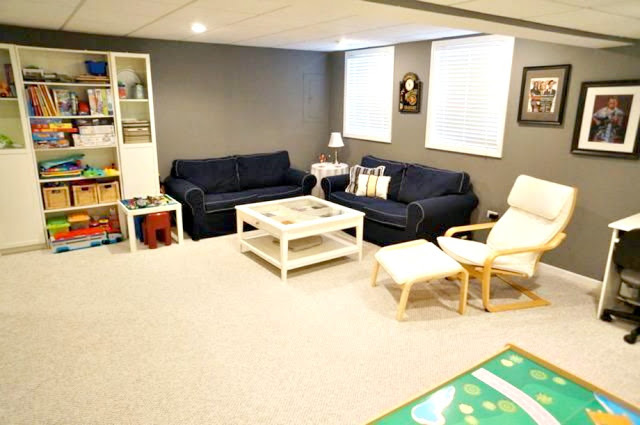 What a fabulous and spacious man cave! Talk about a beautiful tribute to his years in the fire service. Some day you must write about the history of that fire truck door - very intrigued. How *COOL* is this?!?!?!? I know your hero loves it.....and he should! I love themed man caves, but this one is super special. Love the firemen accents, Kris! Kudos to you! Oh my goodness, if only my man's MAN CAVE were that nice...wow! His is full of college and football days (and not in a good way) LOL :) Beautiful transformation and so classy! What a wonderful tribute, Kris. Terry's man cave looks SO inviting. Wow, and a kitchen too. Love all his special treasures. Loved this post Kris! 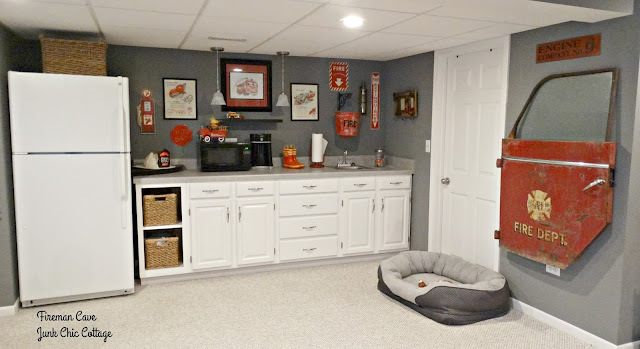 I really believe that we all need to have our own space that reflects who we are as individuals, and I love that Terry has his man cave to do just that for him. It looks so amazing filled with all his treasures! As the wife of a firefighter (retired) I know the sacrifices you have made, too. You are both a blessing. Thank you for sharing this wonderful post. My husband read every word! 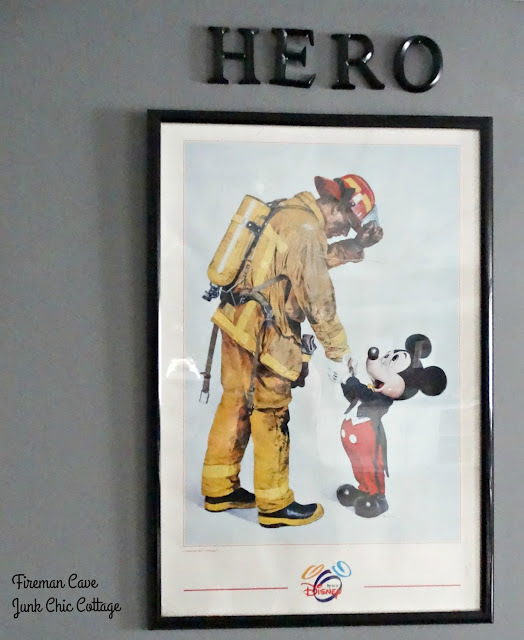 My son is a fireman so I totally understand his decor'. Oh the back draft sign, lol, my Son and I watched that movie at least a 1K times. 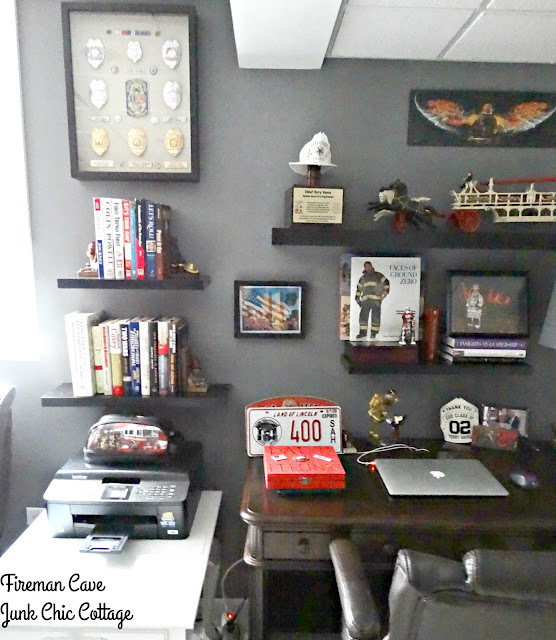 Ya'll did a beautiful job on his man cave, enjoy Terry, and thank you so much for your Service! You know I am away from blogging for a bit---but I had to pop in to see this fireman cave!! Love it, Kris. 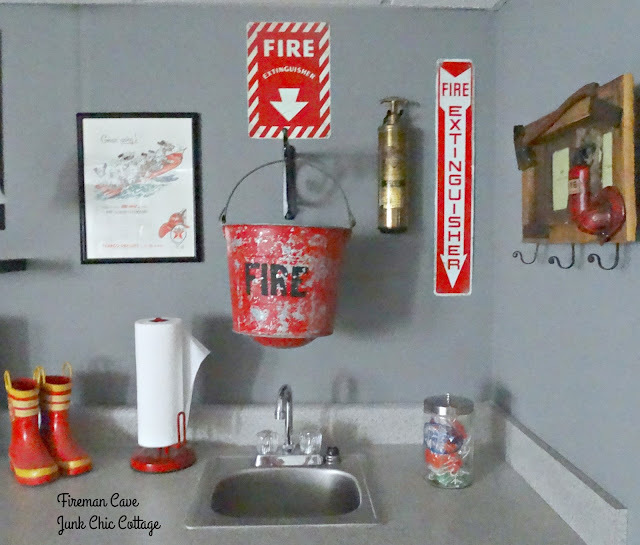 He has some wonderful pieces there and we are more 'connected' to the fireman's life in our own lives now, too. We have a whole new level of love, understanding and respect for firefighters because of the new guy that we hope will be part of our family someday. Hi Kris, LOVE the Fireman Cave!! Such wonderful treasures to display along with the special memories they have. Love the poster with Terry and the 911 piece. WOW everything makes this space awesome. You two did a beautiful job of designing this special space. We honor those that serve us in the dangers of fire and more. Please thank Terry for us in all he does and did to bring safety to all he touched with his service!! What a great room. Loved your comment that he only needs a bed down there - I think I need to build by hubby a man cave! I think the DOOR on the wall is such a unique piece!! What a honorable profession - be proud of him!! 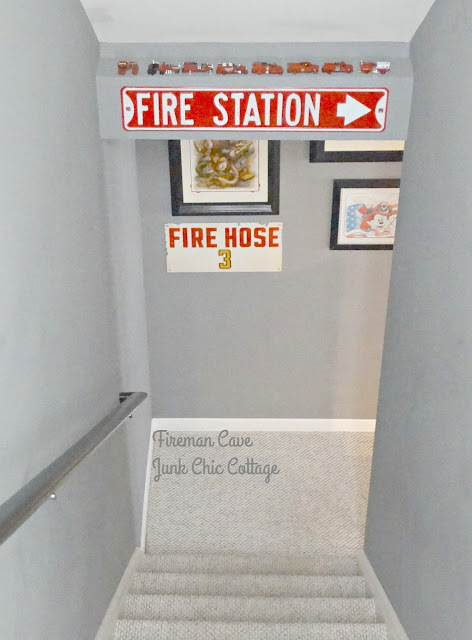 Your hubby definitely deserves his own fireman cave, and what a cave you've created, Kris! Amazing! Love this man cave! It is evident how much heart Terry has for his profession. I need to show this to my son. Once again, I wish you lived closer so he could meet Terry. What a phenomenal role model he would be. I appreciate how many meaningful pieces are down there. Living so close to NYC, anything 9/11 related is very near and dear to us. Billy was called into work that day and sent as back up to the city. It was my scariest moment of the wife of a police officer to say goodbye to him with a baby on my hip and a toddler next to me because we still had no idea what was happening and if there would be more attacks at that point. Fortunately, he only made it to a staging area and came home safely. But many in our community did not. For the sacrifices Terry has made, he deserves to sit back and relax in this awesome space! What a fabulous "man/fire" cave for Terry....I am amazed at his vast collection. A great place for him and Cooper. Funny that both of our hubbies started out with an Architecture major and went on to other careers....I hope you tell us about the story of that wonderful door of the fire truck....Sorry for Terry's loss of a great friend....such a special person.